Information on how to use library resources for citation analysis. This includes information about impact factors, journal rankings, altmetrics and how to find who has cited an article.. The h-index, or Hirsch index, measures the impact of a particular scientist rather than a journal. "It is defined as the highest number of publications of a scientist that received h or more citations each while the other publications have not more than h citations each." 1 For example, a scholar with an h-index of 5 had published 5 papers, each of which has been cited by others at least 5 times. The links below will take you to other areas within this guide which explain how to find an author's h-index using specific platforms. 1 Schreiber, M. (2008). An empirical investigation of the g-index for 26 physicists in comparison with the h-index, the A-index, and the R-index. Journal of the American Society for Information Science and Technology, 59(9), 1513. 1. The Publish or Perish site uses data from Google Scholar. 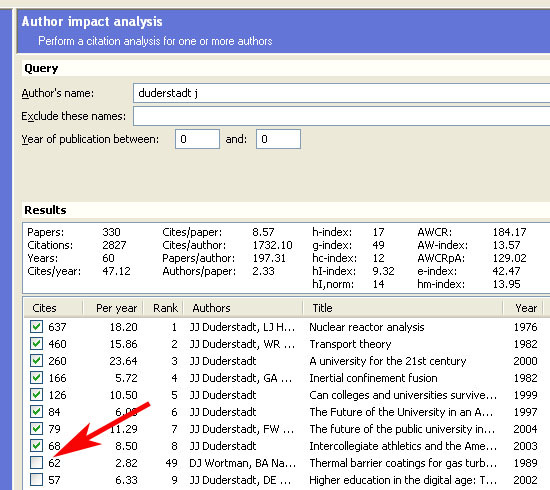 An explanation of citation metrics is available here. 2. Publish or Perish is available in Windows and Linux formats and can be downloaded at no cost from the Publish or Perish website. 3. 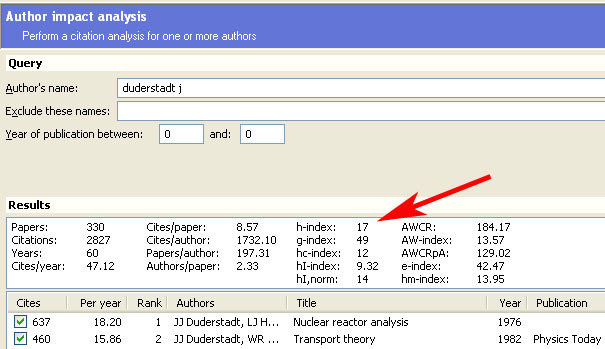 Once you have downloaded the application, you can use Publish or Perish to find h-Index by entering a simple author search. You can exclude names or deselect subject areas to the right of the search boxes to help with disambiguation of authors. 4. The h-Index will display on the results page. 5. You can narrow your search results further by deselecting individual articles. The h-Index will update dynamically as you do this.